Winners have been announced for the 7th annual “CONFiDENCE AWARD DRAMA PRIZE”, the drama series eligible for the awards must have began airing in the Winter 2017 drama season. The awards are organized by a subsidiary of Oricon called “oriconME”, and sponsored by the popular weekly business magazine “confidence”. An esteemed and varied panel of judges consisting of university professors, columnists, writers, and consultants determine the winners. TBS drama “Quartet” completely dominated the awards, nearly getting a full sweep. Out of the 7 categories Quartet won 5 of them, including “Best Drama”, “Best Script” and “Best Leading Actress”. “Quartet” is about four 30-something strangers who all have dreams unfulfilled. 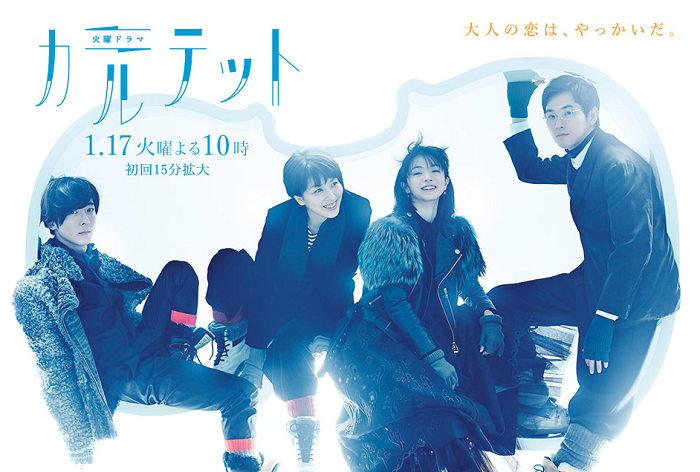 Through a chance meeting they all decide to live together in the small resort town Karuizawa, forming the musical group Doughnuts Hole. But naturally there’s a big secret behind this “chance” meeting. The full list if winners can be seen below. Best Supporting Actress – Yuki Saitou (Okaasan, Musume wo yamete ii desuka?